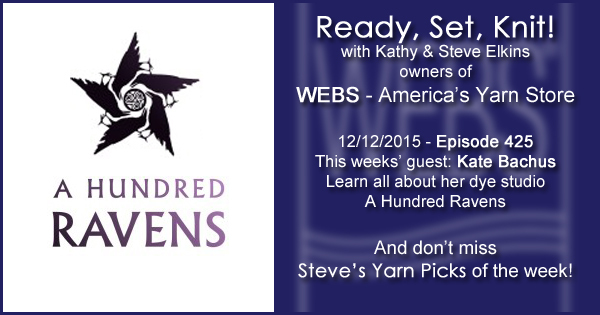 This week Kathy talks with Kate Bachus, founder and owner of A Hundred Ravens. Kate worked as a game designer and knit on the side. 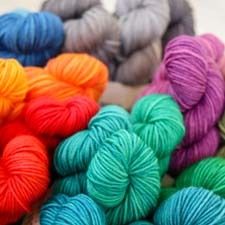 When she began dyeing yarn for fun everyone wanted a skein! Check out the exclusive Iachos gradient kits in colors only available at WEBS. Our annual Year End Blowout Sale will begin online Tuesday December 22 and in store Saturday December 26. Our Winter/Spring classes are now online – go register! WEBS retail store is open Sundays 12-5, now through December 20th. only 2 more Sundays! This entry was posted on Saturday, December 12th, 2015 at 9:00 am	and is filed under Ready, Set, Knit Podcast. You can follow any responses to this entry through the RSS 2.0 feed. You can skip to the end and leave a response. Pinging is currently not allowed.